Costa Rica is the perfect place for adventures like canyoning, surfing and ziplining. There I was 140 feet up a tree in the rainforest of Costa Rica’s Southern Zone. I’d hoisted myself up using mountaineering gear–it took about 30 minutes. Now, as we rested dangling in our harnesses, we watched a trio of toucans of one species eating nuts on a nearby tree and then a pair from another species fly right by our heads. He had me take my hands off the rope and lean back until I was horizontal. I was floating in space. And then, as he reassured me that the harness would hold, he started swinging the rope in a wide circle. I opened my eyes to see the canopy rush by, and the jungle floor 140 feet below. It was a great introduction to the world of adventure sports in Costa Rica, of which tree climbing is just one of a dozen or more. During its many decades as an eco-tourism destination, the country has become famous for these activities, as enterprising outfitters and tour operators discovered many ways for visitors to enjoy Costa Rica’s awe-inspiring natural beauty while getting an adrenalin rush. Costa Rica’s tourism board estimates that nearly half of tourists in the country engage in some sort of eco-tourism during their visit. How many of these engage in adventure sports isn’t tracked, but they are very popular activities. As far as adventure sports go, Costa Rica is perhaps best known for its ziplines, also known as canopy tours. Thick cables are strung between towers or trees in the rainforest. Participants wear helmets, gloves, and harnesses around their waist, complete with a strap that connects, via pulley, to the cable. Then away you go at high-speed through the trees, sometimes over valleys at heights of up to 600 feet. Most operators offer a series of ziplines in one trip. There is also world-class surfing in Costa Rica, especially on the Pacific coast, where the waves have drawn surfers since the 1970s. But it’s not for experts only. Beginners are welcome at surf schools in places like Tamarindo or Nosara, where the waves, though consistent, are more gentle. Jason Gross, of adventure tour operator TicoTour.com , says that one of the top activities for his clients is whitewater rafting on the Pacuare River, which features Class III – IV rapids. There are also plenty of calm spots where you can simply enjoy the jungle and wildlife around. National Geographic named it one of the world’s top river rafting trips. There are also a few activities you really can’t do in many other places, if any. Canyoning involves rappelling down a cliff…next to and through a waterfall. In such a mountainous country with so many rivers, you can bet there are plenty of places to go canyoning. Of course, that’s just the tip of the iceberg when it comes to adventure in Costa Rica. Other activities include horseback riding, deep sea fishing, stand up paddle-boarding, kayaking, windsurfing, kitesurfing, scuba diving, mountain biking, snorkeling, ATV riding, bungee jumping…the list goes on and on. And don’t think it’s only the younger folks taking part. Jason says that although college-age people make up the majority, he’s had clients of all ages and abilities. One notable couple celebrated their 30th wedding anniversary with a bungee jump. And personally I’ve seen everybody from seniors to six-year-olds on ziplines, learning to surf, and more. Anybody can do it. You’ll find adventure tour operators in just about every corner of the country. But there are certain regions that are great home bases because they offer a variety of outdoor activities. San José, the capital city, is a sprawling urban area. But thanks to its central location, says Jason, you can reach many adventure activities in day trips, including bungee jumping, ziplining, whitewater rafting, surfing, and much more. The Arenal region, which features a cone volcano and 33-square-mile lake of the same name, might be the top adventure spot. On the north end of the lake you can wind- and kite surf, especially during the windy season of November to April. You can also kayak on the lake and go fishing. On land, especially in the national park that surrounds the volcano, you can trek through jungle, even clamber onto giant piles of lava rocks from past eruptions. 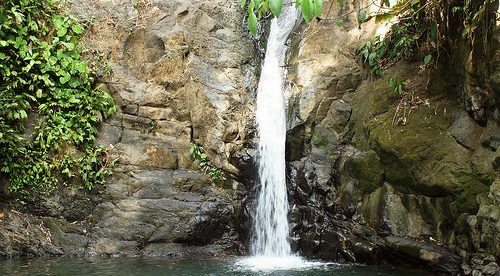 There’s also ziplining, canyoning, waterfalls (with pools for swimming), ATV tours, and more. A trip to Arenal can be easily paired with a stop in nearby Monteverde, says Jason, especially if you have only a week or so to spend in the country. This area in the mountains west of San José features a huge private reserve and the best ziplining in Costa Rica. It’s unique because you’re in the cloud forest, which is essentially a high-altitude rain forest where the trees and plants draw moisture from the clouds that run through.